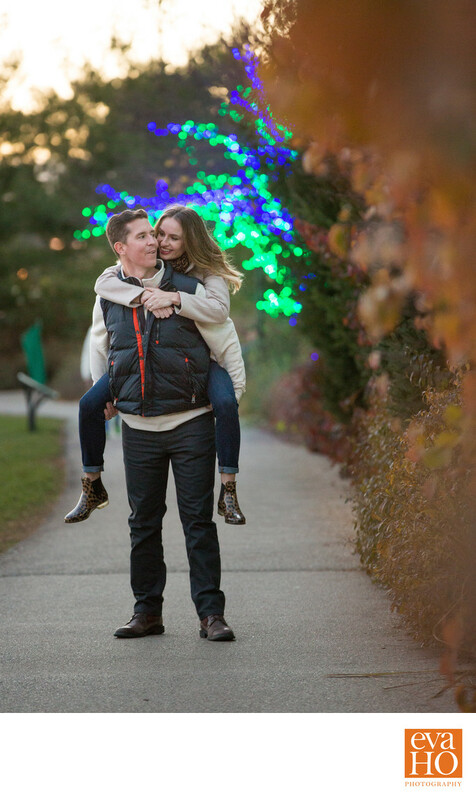 Patrick gives Karen a piggy back ride during their engagement photo session with Eva Ho Photography at the Morton Arboretum in Lisle, IL, a suburb just outside of Chicago. The picture was taken at dawn, just before Thanksgiving when the annual light show, Illumination, at the arboretum starts. Patrick and Karen tied the knot in the spring of 2017 at Hyatt Lodge at McDonald's Campus in Oakbrook, IL. Location: 4100 Illinois 53, Lisle, IL.